Patna, Nov 26: The marriage venue of Bihar's Deputy Chief Minister Sushil Kumar Modi's son has been changed for "security reasons", days after RJD leader Tej Pratap Yadav threatened to disrupt the ceremony. 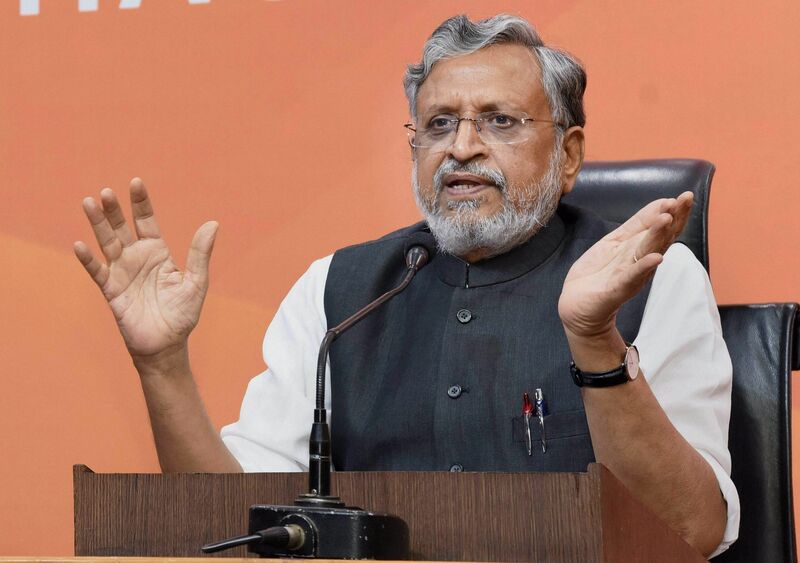 "The venue of Sushil Modi's son Utkarsh-Yamini's marriage has been changed to Veterinary college ground (near Patna airport) from Shakha Maidan in Rajendra Nagar," the Deputy CM's office said in a statement issued here today. "The decision to change the venue has been taken for security reasons in view of some leaders making objectionable statements and threatening to disrupt the marriage," it said. All invitees are being informed accordingly about change of the venue, the statement added. Earlier this week, a video surfaced purportedly showing Tej Pratap Yadav threatening to disrupt the wedding scheduled for December 3, 2017. News channels had beamed the video footage showing Tej Pratap Yadav delivering a speech in Aurangabad district, where he said "I have been invited by Sushil Modi to attend the wedding of his son. If I go there, I will expose him in public". "Uske ghar mein ghus kar maarenge, us shaadi mein vahin sabha karenge, tod phod karenge (will thrash him inside his house, hold a public meeting at the marriage venue and vandalise things)," he was heard saying in the video. Tej Pratap Yadav's comments had drawn strong reaction from the deputy chief minister himself who had urged RJD supremo and Tej Pratap Yadav's father Lalu Prasad Yadav to intervene and persuade his son against making provocative speeches. A local BJP leader, Anil Sahni, had yesterday announced a "reward" of Rs one crore to anybody who slaps Tej Pratap Yadav. But, the BJP condemned the statement and said disciplinary action would be taken against him for his "reckless utterances".